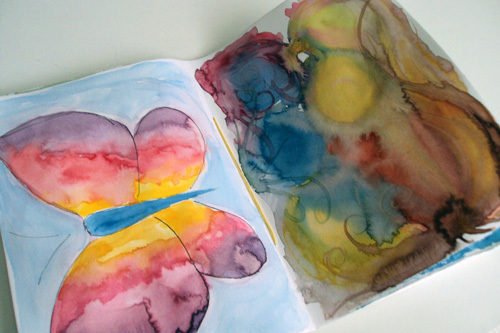 [:en]More pages from the watercolor I made during Easter! I had an idea to draw a butterfly because my best friend loves butterflies! The second one is kinda of abstract and I’m thinking in draw something in top of the background, what do you think? [:pt]Mais páginas das aguarelas que fiz durante a Páscoa! Tive a ideia de desenhar uma borboleta porque a minha melhor amiga adora borboletas! A segunda é completamente abstracta e estou a pensar desenhar algo por cima, que acham? wonderful watercolors! I draw over watercolor a lot, and am usually very happy with the results. Sharpie pen works well, and if you want to draw in white over the dark watercolor areas, try the Sakura Gelly Roll pen–works great. Have fun with this!